If you’ve heard me talk about email marketing, you know I’m a big fan. One of the reasons I love it is that it saves me time by letting me automate some of my email marketing. Sounds great, right? None of us have masses of time to spare, so that’s a big reason why you should be using email automation. Think about when you create your newsletter. This is what’s known as a one-off campaign and you usually send it to your whole list. Now, automated email campaigns are different. You set them up once and then the emails get sent automatically to specific people on your list, depending on the kind of trigger they meet. Wait… what’s a trigger? Well, it’s the action a person performs that triggers the first email in your email automation campaign. This could be joining your list, opening a specific email or clicking on a link. For example, if you join my list through my website, this is the trigger that sets off my welcome email automation campaign. You’ll receive 4 emails from me over a period of time I’ve specified. It’s the same information for everyone. Now, imagine if I had to manually send those 4 emails to all those people. I’d never have time for anything else. Email automation lets me welcome people to my list without me having to stress… it even happens whilst I’m sleeping! Well, I just told you that my welcome emails go out all the time, even when I’m sleeping. And that’s the BIG thing that email automation does for you. It helps you keep in touch with your subscribers and build relationships with them, even when you don’t have the time. But that’s not the only reason why you should be using email automation. When someone joins your email list, you’re not sure if they’re ready to buy from you right there and then. But with email automation, you can nurture them. And by that, I mean you can send them useful, timely information that helps them to get to know, like and trust you. This is important for people when they make their buying decisions. B2C businesses using email automation have seen conversion rates as high as 50%. This is huge! You have the potential of selling to your subscribers through email automation and getting good results. Who wouldn’t want a 50% conversion rate? You’re in business to do business, and these statistics are compelling enough that you should be thinking about how to use email automation in your business. Need some examples of email automation? Of course, you want to know how you can use email automation. Well, here are some examples for you. I’ve mentioned my welcome emails. Why would you want to do this? Well, first impressions matter. What do you want yours to be? Going straight in for the sale, or someone who cares about your customers? 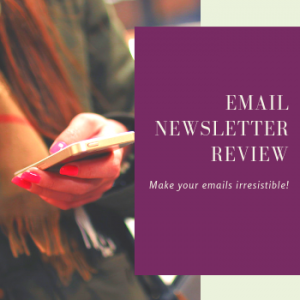 I know what I want to portray, and welcome emails are a great way to do this. Want to know what you’d get from me if you sign up? Just click on the green button in the menu above! Facebook tells you when a friend has a birthday, and you send them a little message. Your friend feels special. How about making your subscribers feel this way? The thing is, you can’t keep checking your lists for when it’s a subscriber’s birthday. But, with email automation, the checking and sending out emails happens automatically. You get to build goodwill with your readers. So, why should you collect this information? Well, no matter how much someone loves your business, it’s only natural for them to lose interest in your emails if they’ve been on your list for a while. But, once a year, you get to thank them for their support and give them a birthday present. It doesn’t have to be big, but it will be memorable for the recipient! One of the best ways to know what your customers and potential customers want from you is to get their feedback. Understanding what their pain points are and giving them a chance to tell you is a powerful way to show you care. Now, you don’t have to send out a survey to everyone. You can set up a survey and then use email automation to send a drip campaign to sub-sets of people on your list. This can be people who have been on your list for a while, from a certain geographical area or maybe even people who haven’t opened any emails for a while. Do you blog regularly? What do you do with your blog posts once you’ve written them? I’m a big fan of repurposing content. And one great way to do this is to create a email drip campaign of older blog posts that your newer subscribers may have not seen. If you’re going to do this, make sure you choose evergreen content. By this, I mean blog posts that aren’t tied to specific events or dates. For example, you might choose a theme for the campaign, such as 20-minute recipes for dinner if you’re a café. Now you can take some of your 20-minute recipes and share them with your subscribers. So, that’s just four ideas for you, but I’m sure you can think of more. Want to know more about email automation and how it can help you? I’m hosting a webinar on 25 April. It’s free to attend and I’ll tell you more about how you can benefit. Even if you can’t make it, it’s worth saving a place because I will send you a recording. So, save your place today!